Just months after a ferry with a similar route shut down its services, Bahamas Express announced that in the coming months it would launch its own fast ferry between Ft. Lauderdale, FL, and Freeport, Bahamas. 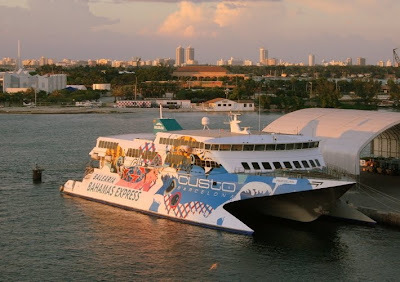 In July of 2011, Bahamas Express remained true to its word, and the Pinar del Rio embarked upon its first journey between Ft. Lauderdale and Freeport – but not without some complaints. The Details: Pinar del Rio is a 32-knot vessel with room to transport up to 450 passengers and 80 vehicles per trip (though currently cars are not being transported), as well as a small amount of cargo. There are bins available to hold the cargo, but must be reserved in advance. The Pinar del Rio traverses 76 miles in two and a half hours, leaving from Ft. Lauderdale each day (spare Wednesday) at 10 a.m., and returning at 5:30 p.m. Guests are asked to arrive 90 minutes prior to departure. The Complaints: Passengers who have traveled aboard Pinar del Rio have complained that despite the low ticket cost, the food sold on board is so overpriced that if you plan to eat during your crossing, you'll be spending enough to make up for your savings. Other passengers have complained that the number of stairs makes it hard to move luggage around, and the number of cargo bins is too few (there are 20). Finally, a large amount of complaints were made about the rough voyage that induced a few bouts of sea-sickness. The Solution: Bahamas Express has addressed the concerns in a blanket statement, saying that they are looking into ways to make improvements, including lowering the ticket price, and adding more cargo bins. While Bahamas Express has made claims that they are working towards improving the ferry and addressing the complaints made by passengers, as of the time of this printing, there has been no evidence of change. Still, many people believe that the minor issues that Pinar del Rio faces is worth it in order to travel between Florida and the Bahamas without having to pay the high cost of airfare. Others wonder exactly how long Pinar del Rio will continue to be in business. Danielle Hamill graduated from the Creative Writing program at Florida State University. As a child growing up in a military family, Hamill spent her childhood traveling the United States, especially enjoying her time spent island-hopping in Hawaii. As an adult, she settled with her family in Florida, where annual trips to the state's wealth of theme parks and historic landmarks satisfy her desire to travel and explore. Hamill currently writes for Interactive Internet Websites, Inc., which hosts a network of Caribbean travel guide sites, including caribbean-guide.info. You can reach Hamill at dhamill@iiwinc.com.